Kennedy & Co Realty, LLC offers full service property management to owners. We currently manage properties all over Tarrant County. Our goal is to take on the stress of managing your rental property so that you can just enjoy the benefits! We are happy to provide you with a description of our services and breakdown of our fees. Please read over the material and give us a call or email with any questions. 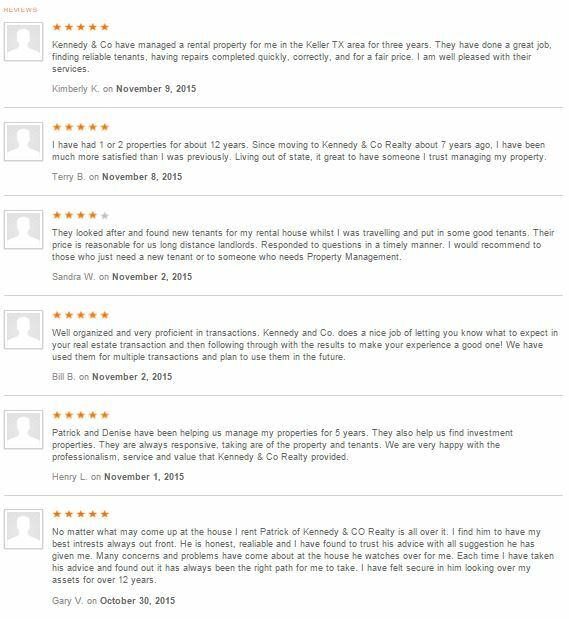 I have had the pleasure of working with the Kennedy's through securing a rental property with my husband as well leveraging her as a property management company for our rental. They have been thorough in many ways. From finding qualified renters for us, maintaining our home while we are in another state and insuring that the best interests of our property are being sought after.